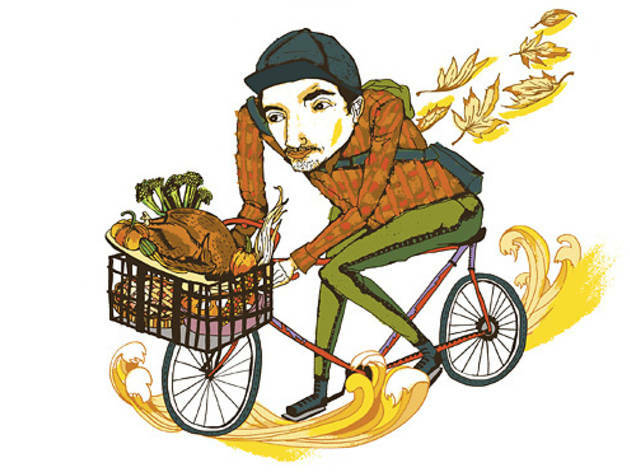 Where to eat out—and where to take out—this Thanksgiving. FrontierSometimes just knowing you don’t have to baste your own turkey is enough to make you feel thankful. For that, there’s Frontier, which offers smoked turkeys to go and classic sides like five-cheese mac, cornbread stuffing and sweet-potato puree. 1072 N Milwaukee Ave (773-772-4322). 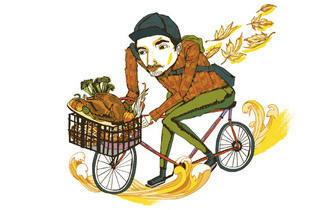 Order by Mon 21; pick up Nov 24, 8am–noon. Turkey: $4.50 per pound. Sides: $10 per quart. The Goddess and Grocer Need a little something for your table? The Goddess offers sides such as roasted root vegetables, whipped sweet potatoes and spinach gratin. Need something more like an entire meal for 12? The Goddess can do that, too. 25 E Delaware Pl (773-292-7100). All orders must be placed by Mon 21. Dinner for 12: $375. Lillie’s QWant one of Lillie’s 15-pound, dry-rubbed, peach wood–smoked turkeys for Thanksgiving? Put away your credit card—these things are only going for cash. 1856 W North Ave (773-772-5500). $75. State and Lake (at theWit) State and Lake’s gourmet Thanksgiving to-go menu serves up to ten people and includes hazelnut–wild mushroom stuffing, caramelized pumpkin bread pudding and, naturally, a maple-brined, oven-roasted turkey. 210 N State St (312-239-9588). Order by Thu 17; $300. Table Fifty-TwoWe don’t know how Art Smith lost all that weight, but we suspect it had absolutely nothing to do with his restaurant’s Thanksgiving menu, which features pumpkin pie, pecan pie, sweet-potato pie with bourbon marshmallows and various buttery sides. 52 W Elm St (312-573-4000, tablefifty-two.com). Order by Fri 18. Pick-up times: Tue 22 and Wed 23, 9am–3pm. Average pie: $35. Custom House TavernExecutive chef Perry Hendrix serves a three-course prix-fixe Thanksgiving dinner (sweet-potato soup topped with a black-pepper marshmallow; turkey with savory bread pudding) at the restaurant this year. But for homebodies, he offers a to-go menu of “Thanksgiving Helpers,” traditional sides like sweet potatoes and vanilla- cranberry sauce. 500 S Dearborn St (312-523-0200). Breakfast from 6:30–10am; Thanksgiving from noon–8pm. $46, kids 12 and under $16. Chicago QChicago Q is gearing up for the holidays with a Thanksgiving feast in the restaurant and various tempting takeout options. As befits an upscale barbecue joint, the free-range turkey is smoked in-house before being topped with roasted turkey gravy and cranberry orange compote. 1160 N Dearborn St (312-642-1160). 11am–8pm; roughly $30 per person (various packages available). Magnolia Bakery Bakeries don’t care about turkey—they care about the pie. This import from New York offers pie in cupcake form with its pumpkin-pecan cupcakes with maple–cream cheese icing. (It also has actual pie of the double-crusted apple variety, as well.) 108 N State St (312-437-7777). Pies: $24. Mercat a la PlanxaThere was once a time when turducken shocked and awed; now, chef Cory Morris ups the ante by stuffing his turkey with foie gras and duck confit, and serving it family-style with plenty of Catalan-influenced sides. Even more scandalous is Mercat’s turkeyless Thanksgiving option—a suckling pig feast, available in the restaurant or to shock your guests at home. 638 S Michigan Ave (312-765-0524). 5–10pm; $140–$440. Both meals must be ordered 48 hours in advance. Big JonesAt chef Paul Fehribach’s Southern-style Thanksgiving, the turkey is deep-fried and ancillaries include Cajun pork boudin fritters, Charleston she-crab soup and bourbon bread pudding. 5347 N Clark St (773-275-5725). 11am–8pm; $46, kids 12 and under $20. BistronomicChef Martial Noguier presents a funky, customizable four-course Thanksgiving that includes foie gras and chicken-liver terrine, roasted farm turkey with chestnuts and glazed quince, and apple crêpes with caramel sauce. 840 N Wabash Ave (312-944-8400). 2–9pm; $55, kids 12 and under $20, kids 5 and under $10. Café des ArchitectsThe only thing more decadent than Thanksgiving is a French Thanksgiving, such as the meal served here featuring brioche-stuffed turkey breast, foie gras torchon atop five-spice pain perdu and a pear gingerbread tart. 20 E Chestnut St (312-324-4074). 11:30am–10pm; $60. MarkethouseMarkethouse brings the farm to the Thanksgiving table in the form of a locally sourced, family-style holiday dinner. Gunthorp turkey “mopped” with maple syrup and thyme, and flanked with heirloom apples, brown butter and brioche stuffing, aims to transport you outside city limits. 611 N Fairbanks Ct (312-224-2200). 11am–9pm; $32, kids 12 and under $16. Shaw’s Crab HouseLet crab—henceforth the Thanksgiving turkey of the sea—reign supreme this holiday season. Shaw’s offers an all-day buffet as well as a family-style dinner in the upstairs dining room for parties of five or more. Both are replete with seafood as well as some more traditional, terrestrial meats. 1900 E Higgins Rd, Schaumburg (847-517-2722). Noon–7pm; $39.99–$45, kids under 12 free.